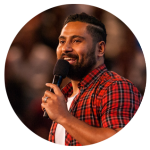 Peter & Laura Toganivalu, AKA “the Toggsys” are youth pastors at Hillsong Church in Australia. They’re passionate about seeing a ‘young and free’ movement rise up across the earth, finding true life, joy & freedom through knowing Jesus Christ. Peter can often be found eating a bucket of chicken while Laura admittedly spends copious amounts of time planning her dream vacations to tropical destinations. As well as youth pastoring, they seek to give a voice to this generation by leading our Y&F worship team – a collective of young people using their God-given talents to glorify Him. But above all, their main job is as Mum & Dad to their 2 kiddies Willow & Jack.